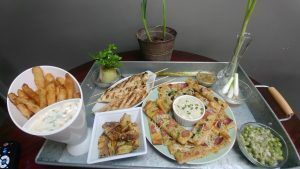 Green Onion Madness, that is what I called my latest TV Segment. 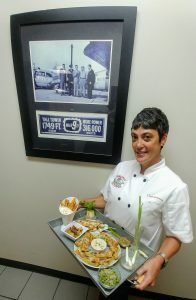 It was a fun morning talking all things green onion, yes, who knew green onions could be so much fun! Green onions remind me of Jack and the Beanstalk. Like Jack’s beans, they grow like magic and a few go a long way. 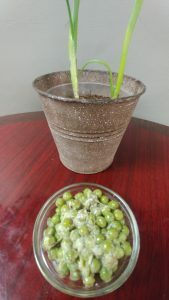 Simply put your green onion bottoms in a dish of water on your windowsill. Change the water every few days. 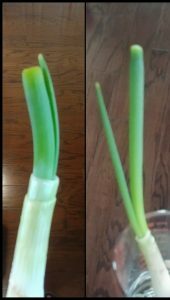 When the roots have lengthened, the green onions can be planted into soil or kept in water. Whenever I hold my food waste workshops, I always present the participants with a lifetime supply of green onions! Yes, lifetime supply, for they will keep growing and growing. Think of all the money saved. Did you know I haven’t needed to buy green onions in over 5 years? Don’t want to plant the green onions? Let’s eat them, root and all! Add flour, salt, and cayenne pepper to a bowl. Slowly whisk wine into flour until smooth. Whisk in hot sauce. Dip green onion bottoms into batter. Fry in cast iron skillet over medium heat until crisp 1-2 minutes. Drain on paper towels. Sprinkle with Cajun seasoning. Stir together all ingredients. 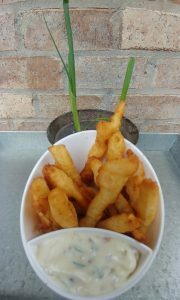 Serve with Tempura Fried Onion Bottoms for dipping. When firing up the grill or grill pan, rub green onions with a little olive oil. Grill until charred in spots. Enjoy as is with drawn butter or make a pesto. Have leftover peas? Add the pesto to plain yogurt, stir into peas and add mint and dill for a refreshing pea salad or add the pesto to yogurt and use as a marinade for grilled shrimp, chicken, or eggplant. 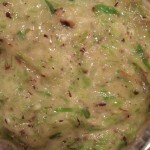 Mix pesto into ricotta cheese and use as a spread on your favorite flatbread or pizza crust. So good with leftover ham, black olives, and mozzarella and parmesan cheeses. 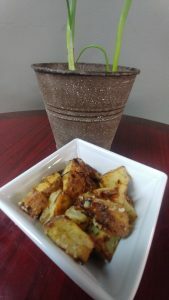 Add extra olive oil to the pesto and toss with cubed new potatoes for roasted potatoes or use as a marinade for flank or skirt steak, vegetables, or tuna steaks. Put Your TO COOK IS TO CREATE Thinking Cap On: What other flavors would compliment the green onion mixture? Lemongrass? Char some along with the green onions for an Asian flair. Like it spicy? Grill some peppers along with the green onions before pureeing mixture. What else could you use the green onion mixture in? A little dab in some mayo is delicious on a burger! 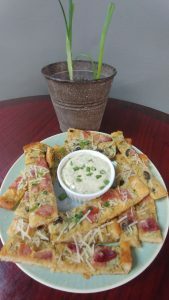 Mix some into Ranch dressing and use as a dip for the flatbread. What else would be good basted with the sauce on the grill? How about a vegetable skewer? Don’t want to turn on the oven, add pesto to potato packets for the grill. Think about recipes that use green onions, what are some other ingredients? Could they work in any of these recipes? FOOD FUN: Isn’t growing green onions fun? Don’t stop the growing excitement. 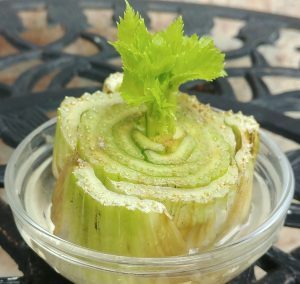 Did you know you can do the same with celery bottoms?